Back in 2015 a Town Councillor attempted to push Lyoness onto residents of Hailsham, a town in East Sussex, England. Upon other members of Hailsham council learning of the Lyoness AU investment Ponzi scheme, the project was suspended indefinitely. Two years later, a Town Councillor in another English town has pulled the same ruse. Woking is a town in northwest Surrey, England with a population of 62,796. On the front-page of the March 23rd, 2017 edition of Woking News & Mail, Lyoness was touted as “groundbreaking international loyalty card scheme”. The proposed scheme would involve shoppers signing up for the Woking Loyalty Card Programme with shops and other businesses in the town center. The card, run by international company Lyoness Management, is available in Britain, but Woking Borough Council would be the first local authority in the country to team up with Lyoness. In addition to a government council pushing a Ponzi scheme onto residents, the problem is that whoever introduced Lyoness to Woking Borough Council stands to make a lot of money – another fact not disclosed to residents. Instead, they get the rosy “shopping card” pitch, which states only that local businesses and Woking Borough Council will receive 0.5% of all transactions made with cards issued by Woking merchants. Not disclosed to residents is the Lyoness MLM opportunity. Lyoness affiliates sign up and invest thousands of dollars in “shopping units” (originally called “accounting units”). They then earn a ROI by convincing other affiliates to invest money in shopping units. Shopping units can also be created via legitimate shopping, however this process can take years as opposed to direct investment. The Ponzi element comes into play upon consideration of new investment being used to pay existing Lyoness affiliate investors through shopping units. As per the Woking News & Mail article, a proposed plan to push Lyoness onto residents was made on March 23rd. There was of course nothing about Lyoness Accounting or Shopping Units in the March 23rd executive summary presented to the council. On April 6th Woking’s Council Executive, who were expected to approve the introduction of Lyoness into Woking on April 6th. The draft plan involved the scheme being introduced initially to the town center, and then to other parts of the borough, with the hope that surrounding local authorities will see the advantages and join in. It is believed that some local authorities in London are watching the planned Woking scheme closely. I bet they are, what with Lyoness being an internationally recognized Ponzi scheme. Thus far I’ve been unable to find any details on who spearheaded the introduction of Lyoness to Woking Council. This of course are the Lyoness affiliate or group of affiliates who will benefit far beyond the 0.5% paid to Woking merchants and the council. This would be great – it will help put Woking on the map as the card will be available globally – as far apart as Australia, Dubai and elsewhere. Witht he benefits to businesses, shoppers and good causes, it is a win-win situation. I hope the executive and council agrees and look forward to this coming to the town. The Woking Loyalty Card website, which uses Lyoness’ new “Cashback World” branding, doesn’t disclose whose behind it. The website domain however is owned by Jonathan Lytle, through a residential address in Camberley, Surrey. That lead me to the Woking Chamber of Commerce website, which lists Lytle as the official contact for “The Woking Loyalty Programme”. Lytle, through Woking Loyalty, sponsored a “networking gathering” at the New Victoria Theatre in March. 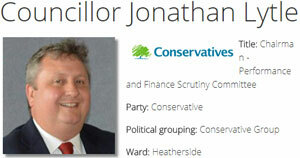 Oh and did I mention Jonathan Lytle is a Surrey Heath Borough Councillor? Whereas Hailsham Council terminated attempts to push Lyoness onto unsuspecting residents in time, it appears Woking has given the Ponzi scheme its blessing. The front-end of the Woking Loyalty Programme will see residents given the cashback spiel. On the back-end Councillor Lytle and any Woking council members he’s recruited under him, will make a ton of money in generated shopping units. The specifics of which and how much will of course not be disclosed to Woking residents. From there all it takes is a few local Lyoness affiliates to tout the business opportunity and start soliciting investment from residents, and before you know it Woking residents are pumping money into Lyoness directly – and they’re going to believe it’s legit because the local council introduced the business to them. Seriously, what is it with UK Councillors abusing their positions to push Ponzi schemes? Shoutout to the BehindMLM reader who brought this to my attention and did the homework! So was this scheme introduced? The Woking newspaper article was dated March 2017. WHAT? I read it as 2018. I thought it was a bit strange the Woking Loyalty Twitter account was backdated well before March, 2018. AFAIK the scheme is in place. Although there’s no media coverage after early 2017. Lyoness is a scam, and will go down in history as the biggest ponzi scheme on the planet. In Australia Lyoness has slowed down. There are still a couple of peddlers out there trying to get new people to purchase large amounts of units. If you are reading this and are considering buying units. DO NOT WASTE YOUR MONEY…. if you want to throw it away at least donate it so a good charity it will do more good than fund Hubert’s lifestyle. Tories pushing this does not surprise me in the least. Andrew Penman of the Mirror know about this? I’ve also emailed this story to Private Eye. This is exactly the kind of story that appears in their Rotten Boroughs section every fortnight. Local councils are a joke, who consist largely of politicians so outstandingly incompetent or corrupt they couldn’t make it on the national stage (which is saying something). Less than a third of eligible voters bother to vote in council elections. This story will not surprise anyone who reads Rotten Boroughs.